Otzmah rejects proposal of Jewish Home-National Union to accept seats 5 and 8 in united list. Negotiations with Yishai also in crisis. A meeting of representatives of Otzmah Yehudit and representatives of the Jewish Home-National Union list that took place today remains deadlocked with no agreement in sight. Arutz Sheva learned that at the meeting Otzmah representatives were offered places 5 and 8 as a technical block on a united list, but Otzmah demanded places 4 and 8, or 5 and 7. At the same time, senior Jewish Home officials threatened to resign if an agreement was signed for a joint run with the Otzmah party as internal pressure within the party on the issue grows. 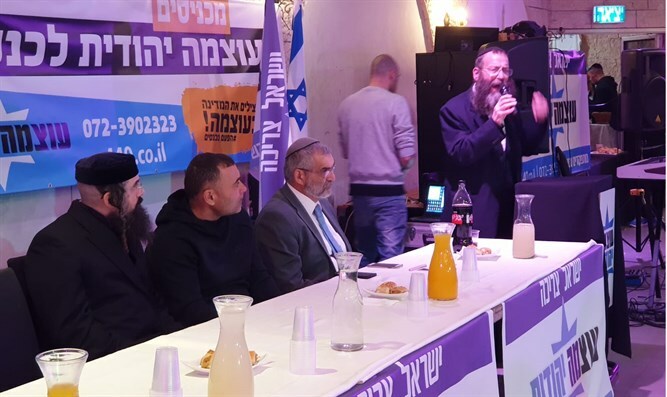 Sources in the Jewish Home-National Union list noted that Otzmah's refusal to accept the updated proposal creates a situation where it will be impossible to pass any proposal for unification in the Jewish Home Party central committee. According to the same sources, "These are ego games. If the Otzmah list chooses not to accept the proposal and continues to insist, responsibility for the fate of the rightist bloc will be on them," the sources said. Otzmah Yehudit responds: "We compromised and compromised, far beyond what was required, but Jewish Home and the National Union don't want the unification and victory for the Right in the elections, and prefer to risk the establishment of a leftist government that will bring about Oslo II. Otzmah Yehudit is well prepared to run independently, and will be a strong list that will be the surprise of the elections." During the course of the day, the negotiations with Eli Yishai also came to a standstill, after Yishai rejected a proposal to accept a ministerial position in exchange for placing him in an unrealistic place on the list, a commitment that was also backed by the Prime Minister.